Roller Derby of Central Kentucky (ROCK) is Lexington, Kentucky’s premier Flat Track Roller Derby league. It is a non-profit business that fosters athletic growth and integrity in it’s members and gives back to the community. ROCK is athletic. For many women, roller derby is their first team sport and athletic endeavor. The skaters in ROCK train daily to perform at their highest levels to win bouts and give spectators a great sporting experience. This is evidenced by a very loyal and ever growing fan base. 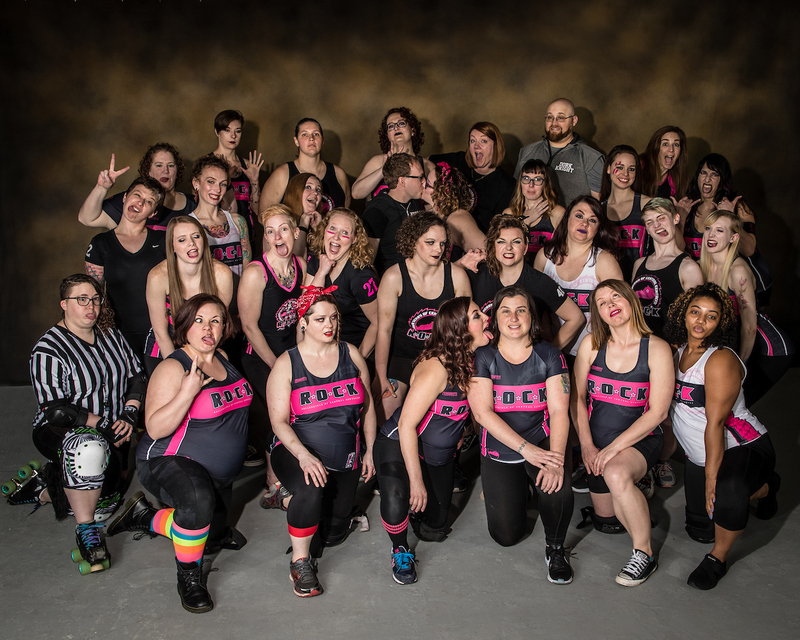 As a proud member of the Women’s Flat Track Derby Association (WFTDA), ROCK’s finest skaters compete at home, regionally, and nationally against other high caliber teams. ROCK is focused on community. Not just a sports team, ROCK is a registered non-profit business that is committed to enhancing the fabric of the unique city that is Lexington. ROCK gives time and money to several local charities (including Ampersand Sexual Violence Resource Center of the Bluegrass, Toys for Tots, Wounded Warriors, and the Lexington Humane Society) and partners with local businesses whenever possible. ROCK can also be seen in local newspapers, on newscasts, heard on radio stations, and spotted at local events such as parades, store openings, and charity events. ROCK is empowering. Training for an athletic pursuit builds positive body image and the grassroots business model engages and empowers women in all walks of life as local business owners. The skaters, as well as invaluable volunteers, give their time and money to keep ROCK alive and thriving. The experience of not only being an athlete, but owning your own league is unrivaled in the ability to empower and enrich members’ lives. Two skaters remain from the original ROCK team from 2007: Kitty O’Doom, and Ragdoll. Our practice space has no heating or air conditioning, so we often hold meetings next door at West Sixth Brewery.